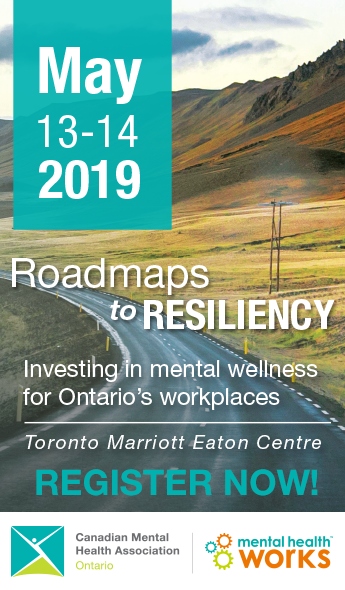 More than 300 delegates attended Canadian Mental Health Association, Ontario Division’s 2019 conference, The Quality Culture: Building Better Together, which wrapped up Tuesday afternoon after two days packed with 30 clinical, front-line and governance sessions and four keynote addresses. In addition to those physically in attendance, interest in the conference on social media was widespread, with CMHA Ontario earning more than 3.4 million impressions and a reach of over 480 thousand on the hashtag #CMHAONCONF2019, trending in Canada on Twitter. Keynote speeches included: veteran emergency room physician and medical media personality Dr. Brian Goldman on the power of kindness and empathy in health care; registered psychotherapist and co-executive director of TEND Academy Françoise Mathieu on compassion fatigue and burnout; award-winning national health writer André Picard on the potential impacts of structural reform in the health system; and health care expert Dr. Joshua Tepper on lessons he’s learned through work in quality improvement and how they might apply to the provincial health system transformation currently underway. The event brought together board volunteers, agency leaders and clinical/front-line staff to discuss the integral role everyone plays in creating a “quality culture” in the community-based mental health and addictions sector. View conference photo gallery here.